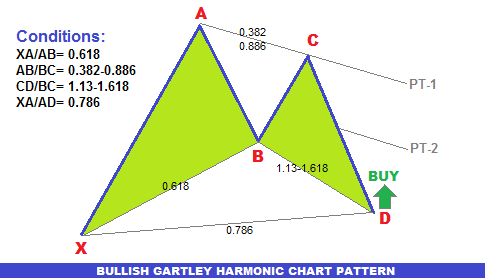 Bullish Gartley harmonic chart pattern suggests a buy order upon completion of the pattern. 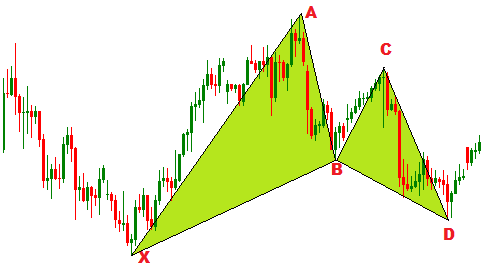 Here in the above image, XABCD is a bullish gartley harmonic chart pattern. In the first portion of the post, I am going to explain the way to find a bullish gartley harmonic chart pattern, and in the second portion of this post, I am going to explain the the way to apply the bullish gartley harmonic chart pattern. 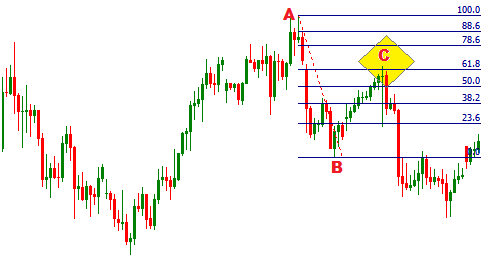 How to find a bullish gartley harmonic chart pattern? To find the bullish gartley harmonic chart pattern on candle sticks chart, we have to go through the following steps. Firstly, we need to find the X and A points of bullish gartley harmonic chart pattern. X and A points are found at the bottom and top of a strong bullish trend respectively. Secondly, we have to confirm the point B of the pattern. To find the point B, draw a fibonacci retracement tool from point X to point A. Point B should be confirmed by the 61.8% fibonacci retracement level of XA, in other words XA/AB should be equal to the 0.618. Now let's confirm the point C. To find the point C, draw a fibonacci retracement tool from point A to point B. The point C should be between the 38.2% and 88.6% fibonacci retracement levels of AB, in other words, AB/BC should be equal to the 0.382-0.886. 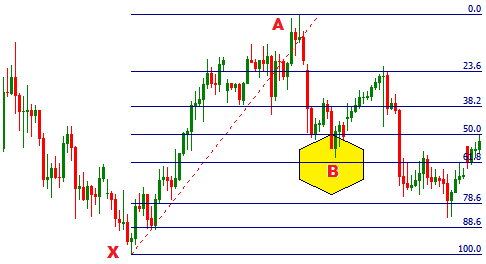 In this step, draw a fibonacci retracement tool from point B to point C to confirm the point D. Point D should be between the 113% and 161.8% fibonacci retracement level of BC, in other words, CD/BC should be equal to 1.13-1.618 range. We can see in the previous step that the D is between the 1.13-1.618 range, but it does not accurately confirm point D. That is why, point D is reconfirmed here. 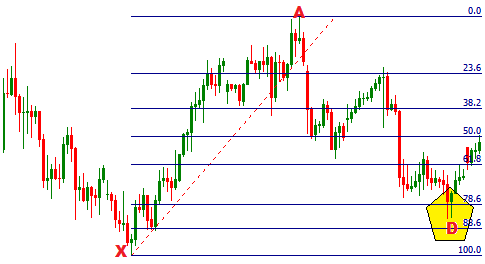 To reconfirm point D, draw a fibonacci retracement tool from X to A. Point D should be at the 78.6% fibonacci retracement level of XA, in other words, XA/AD equal to 0.786. Now we will draw the XA, XB, AB, BC, BD, and CD straight lines to find the bullish gartley harmonic chart pattern. 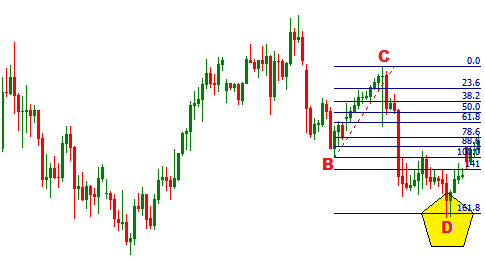 How to apply the bullish harmonic chart pattern in forex trading? The technique is very simple. Just place a long order when the point D is confirmed. The stop loss for the order will be placed at the price level at point X. The profit target for the order should be placed at AC trend line. Conservative profit target can be placed at the 50-61.8% fibonacci retracement level of CD. Some traders also take the advantages of trading at point B and C, but these need advance fundamental and sentiment analysis. Dear traders, join the discussion, dropping a comment below, or subscribe yourFXguide to receive updates. Charts are required to trade with full technical analysis of market i want to say that this is a tremendous post. Nice article... Several things in here' haven't considered before.Thank you for making this type of awesome publish that is really perfectly written, is going to be mentioning lots of buddies relating to this. I just came across this site and you have some valuable information. I was wondering, your conditions for the CD/BC leg is 1.13 - 1.618. However, elsewhere I have found that the CD/BC leg is 1.27 - 1.618.